Jeremy Pickles was born in 1946 in Hampstead. He attended Tonbridge School in Kent and was awarded a scholarship to St John’s College, Cambridge when he was 16. He spent seven years there, gaining a BA and masters, followed by a PhD in Theoretical Physics with a thesis titled ‘Many-body Theory and the Landau Theory of Fermi Liquids’ under the guidance of Brian Josephson (later a Nobel Laureate). He was also a Cambridge Blue in athletics, specialising in the 880 yards. After leaving Cambridge he became a Research Officer at the Central Electricity Research Laboratories for 20 years, with some success; in 1977 he won a prize for a paper on the calculation of electric fields using Monte-Carlo methods. In 1992 he left to set up his own consultancy, Statistics Extremes. A keen advocate of the beauty and relevance of mathematics, he began teaching A-level maths on a parttime, voluntary basis at St James Independent School, where both his sons had been pupils. He was also an active member of the Institute of Mathematics and its Applications and chaired its London branch from 1993 – 1996. He attended philosophy courses for many years and through these was initiated into meditation and also introduced to Vedic mathematics. This is an old system of mathematics from the ancient Hindu Vedas that was rediscovered in the early 20th century. The simplicity of the techniques interested Jeremy greatly and he gave a number of lectures on Vedic maths together with Andrew Nicholas, Kenneth Williams and James Glover. He also coauthored two books on the subject: ‘Introductory Lectures on Vedic Mathematics’ and ‘Vertically and Crosswise’. Throughout his years of teaching, Jeremy made up his own homework questions for his pupils. 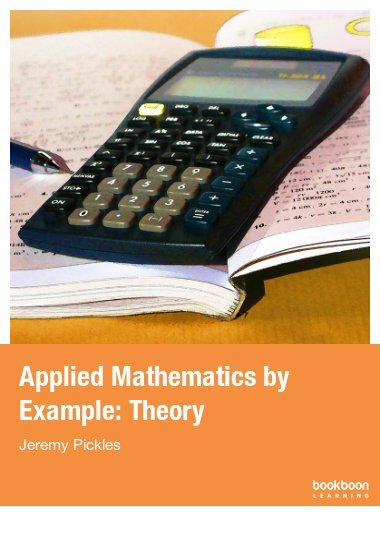 He wanted to give them practical problems that demonstrated how mathematics worked in the world. He also wanted to give his students an insight into the history of mathematics, something often overlooked. He had a great love and understanding of his subject and was able to convey it with patience and simplicity even to the unmathematical mind. In 2004, I suggested that he write a book incorporating some of his ideas and work sheets so they could be used by others. He was able to complete it just two months before his death from cancer in 2006.